Promoting leadership, growth and advancement in analytical design, multidisciplinary research, and training. In a study published today in Nature Sustainability, researchers from PCIGR analyzed honey from urban beehives in six Metro Vancouver neighbourhoods. 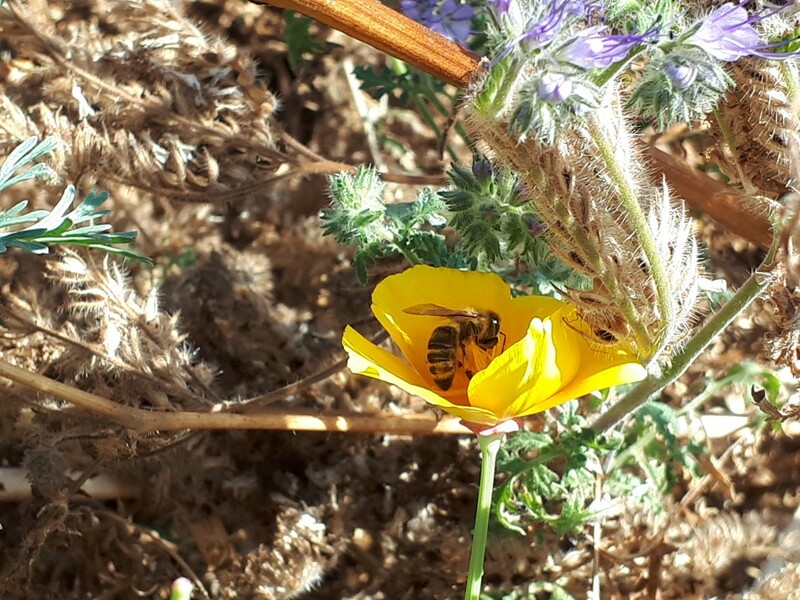 Since honey bees typically forage for pollen and nectar within a two- to three-kilometre radius of their hives, honey can provide a localized geochemical “snapshot” of the local environment. They found that the honey in Vancouver is extremely clean, well below the worldwide average for heavy metals like lead. In fact, an adult would have to consume more than 600 grams, or two cups, of honey every day to exceed tolerable levels. However, the researchers found that the concentration of elements increased towards the downtown core, where hives are located near areas with heavy traffic, higher urban density and industrial activity such as shipping ports. In other places like Delta, the honey showed elevated levels of manganese, which could be related to agricultural activity and pesticide use in the area. PCIGR researchers also compared the lead isotopic compositions of the honey to those from other local environmental samples like lichen from around BC, rock from the Garibaldi volcanic belt, sediment from the Fraser River and trees in Stanley Park. They discovered that the lead “fingerprints” of the honey did not match any local, naturally-occurring lead. Rather, the honey from downtown and trees in Stanley Park displayed some striking similarities that pointed to potential manmade sources of lead. The study reports four years of high-quality, consistent data that serves as a present-day baseline, allowing researchers to monitor small changes in Metro Vancouver’s environment as the city grows and evolves. The PCIGR team will continue to study how honey analysis complements more traditional air and soil sampling techniques and test the efficiency of honey as an environmental biomonitor in other cities around the world. The research was carried out in partnership with Hives for Humanity, a local non-profit organization that creates opportunities for people in Vancouver’s Downtown Eastside to engage in urban beekeeping. 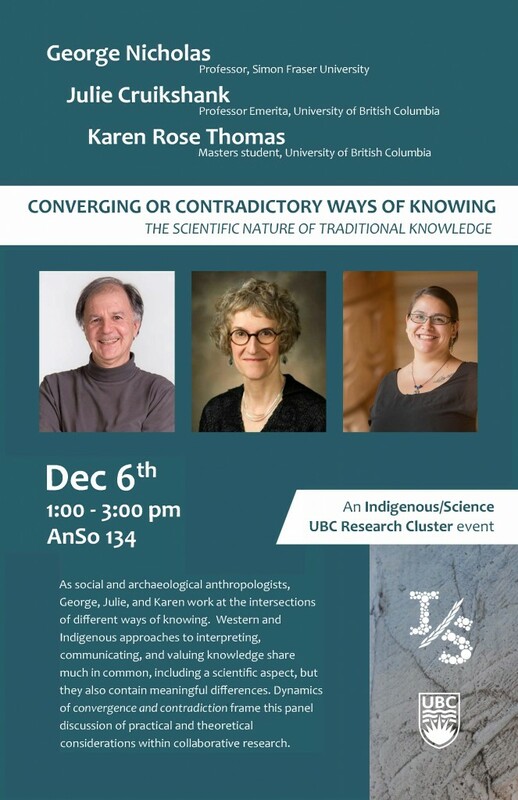 Join us for a thought-provoking panel discussion on Western and Indigenous ways of knowing with local anthropologists from SFU and UBC. This event is part of the Indigenous/Science UBC Research Cluster seminar series. 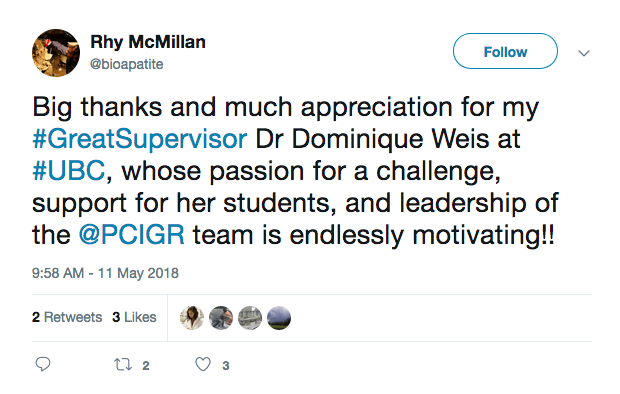 PCIGR Director Dominique Weis was recognized as a great supervisor by her PhD student Rhy McMillan during UBC’s second annual Great Supervisor Week (May 7-13, 2018). Graduate students were encouraged to give kudos to their graduate supervisors using #GreatSupervisor and #UBC on Twitter or Facebook. 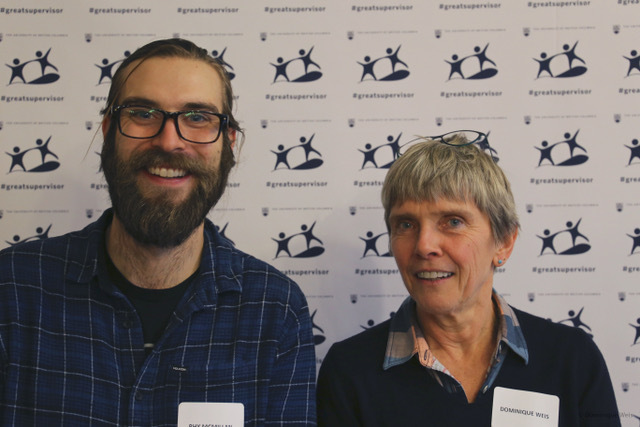 Dominique and Rhy then attended an event celebrating UBC’s great supervisors at Graduate and Postdoctoral Studies on November 1, 2018. Congratulations Dominique on this well-deserved honour! Dominique Weis elected AGU VGP President-elect! 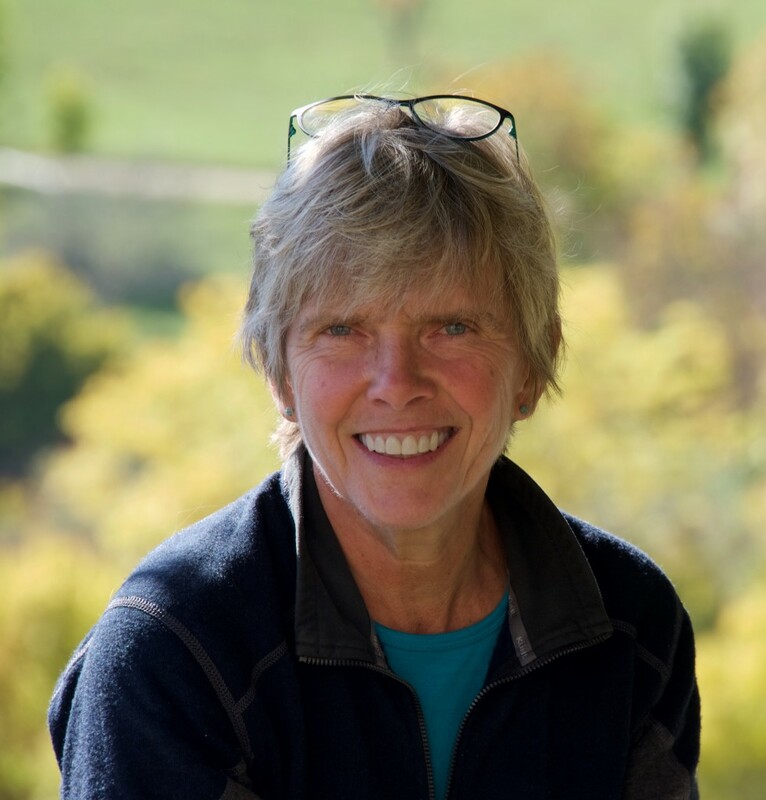 Congratulations to PCIGR Director Dominique Weis, who was elected President-elect of the Volcanology, Geochemistry, and Petrology (VGP) Section of the American Geophysical Union (AGU). The Leadership Development/Governance Committee recently announced the results of the 2018 AGU Elections. Newly-elected leaders begin their term on 1 January 2019 and serve a 2-year term. The chemical and physical evolution of rocks and minerals, particularly igneous and metamorphic rocks, falls under the purview of the Volcanology, Geochemistry, and Petrology Section. Because of the Section’s interest in studying and mitigating the hazards of volcanoes, its work has a direct bearing on public safety and the preservation of life. VGP overlaps strongly with other Sections, such as Planetary Sciences, Tectonophysics, Seismology, Geomagnetism and Paleomagnetism, and Hydrology. Subduction zones are unique to Earth and fundamental in its evolution, yet we still know little about the causes and mechanisms of their initiation. 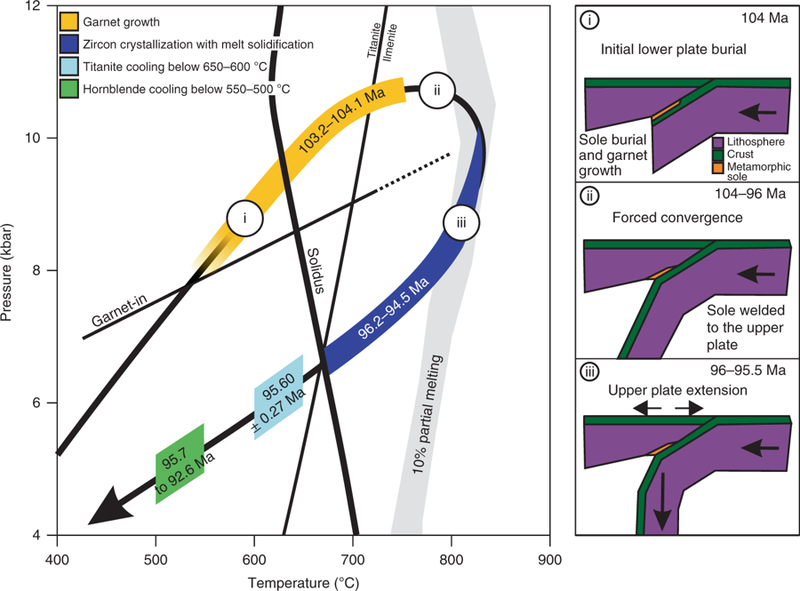 A new study, co-authored by PCIGR researcher Matthijs Smit and published this week in Nature Geoscience, investigates a fossil system, the archetypal Semail Ophiolite of Oman, which exposes both lower and upper plate relics of incipient subduction stages. Lu–Hf and U–Pb geochronology of the lower and upper plate material indicate that initial burial of the lower plate occurred before 104 million years ago, predating upper plate extension and the formation of Semail oceanic crust by at least 8 Myr. Such a time lag reveals far-field forced subduction initiation and provides unequivocal, direct evidence for a subduction initiation mechanism in the geological record. Guilmette C., Smit M.A., van Hinsbergen D.J.J., Gürer D., Corfu F., Charette B., Maffione M., Rabeau O., and Savard D. 2018. Forced subduction initiation recorded in the sole and crust of the Semail Ophiolite of Oman. Nature Geoscience, 11, 688–695.